I am presently living in a Hotel called Video City in Mampong, Ghana. Located about one hour north of Kumasi, it is strategically located, far enough away from the big city to be comfortable, yet close enough to enter and buy what I need. It is easy to get a good Hotel room in Ghana for 10 Dollars per night; therefore, you can pay 300 for rent, and 200 for food, and easily live on 500 Dollars per month and be a tourist. If you want an apartment, I would expect you need to pay right around 75-100 dollars per month, but finding anything furnished would be an act of God. As normal, there are always locals who try to convince you to pay the same as the USA, as if somehow Ghana prices are not applicable to foreigners. The city of Sosua, Dominican Republic, or Panajachel, Guatemala are cities that exploded with tourism in the past. They overbuilt and drove the prices down to the nub for rooms and benefits; there is a surplus of cheap room, while in Africa there has never been a tourist. A good strategy would be to find former tourist trap Mecca and rent room, for example Acapulco in Mexico. What started me thinking today was Bah getting out a piece of paper and writing down numbers. She is good with money; she calculated that the two of us are paying 800 USD per month to live in this very large 360 square foot room. She added up the cost of 300 per month, then food, and even included my 5 dollar per day Internet cost and calculated we are paying 800 Dollars per month. She wants me to return to Ivory Coast, and rent an apartment, however when I return she knows that paying 300 per months is stupid. We can rent an extremely good apartment in Grand Bassam for 100 per month, this is the expensive one. Therefore, she was mapping out a budget in Ivory Coast where we can live for less than 600 Dollars for two of us, and we would be living better than any of her friends. This is the benefit of living with a white man, she becomes rich, and I can be a poor American, I can live on the lowest amount of money, yet live in the most expensive apartments in an area for an upper upper middle class person of Ghana. There is an extremely rich class, the two percent in Ghana, Ivory Coast or Togo that have more money than any American has ever thought possible, so exclude the idiots from this scenario. I am suspecting as I semi-retire I will rent 3-5 apartment by the year in different cities around the planet. If I rent them for roughly 75 dollars per month, I can pay 300 USD per month; have completely furnished apartments waiting for me when I return for three months per year. The longer a person stays in a room or an apartment, the better the situation. OK, that is the quick list off the top of my head, there is more, and Bah does like to buy clothes, and we like to eat beef kabobs here at night. We do not drink alcohol, and normally drinkers need to double their budgets. 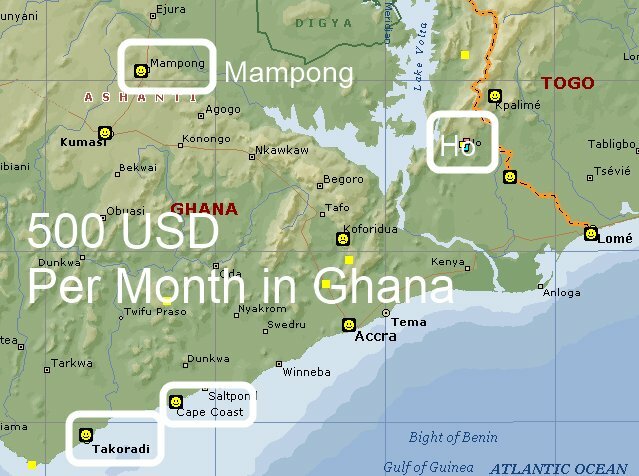 I used 6455.5 Megs of data in a 30-day period in Ghana, at roughly 2 cents per Meg here, the total I paid was 129 USD. This was included in the 800 dollars per month I paid, so do not think I am living badly. This may well be the most expensive Internet of my travel life, however maybe the most convenient and it allows me to move freely around the country. Sign up for "My Hobo"
If you are planning a long trip, then I recommend you download this or another free program and measure your usage. If you are businessperson, it is good to know your daily needs and budget the cost. If I used the amount of bandwidth I want, it would cost me 2880 USD in Ghana. I now know, I can manage my Internet business with about 6 Gigs per month. However, my optimal usage is 4.8 Gigs per day or 144 Gigs per month, this was my usage in Senegal whereby I had an unlimited internet access in the room, but was paying 700 Dollar per month for the room. I was agreeing to be gouged for only 18 days in Senegal because I did not like the country and was planning to leave. I need to use this type of Bandwidth for a few months to optimize my site, and would rather pay 200 Dollars per month in the Dominican Republic or Guatemala. I know this is confusing, however the solution is easy, start your trip in a country like Guatemala or Dominican Republic and work your way up to Africa. (Or down.. Hehehe) There are many people on the planet who wish to work using the Internet. Soon the companies like MTN will open up and give us unlimited Internet on the whole planet, right now they are just gouging because they can and there is no competition. I discovered a little trick in Guatemala. I use a Tigo stick for my internet occasionally (my hotel has wifi, but it is often out). 30 days of service is about $40 for 8GB of transfer. Or you can choose the $20 plan for 1GB of transfer. But here's the trick: When you reach your data limit, the stick continues to work until the end of your 30 days -- albeit at a "slower" speed. This costs nothing and I find it works for most situations. If I need to upload/download big files, I go to a bar or restaurant... or use my hotel wifi if it's working. Essentially you get 30 days of unlimited data for $20. Not too shabby!